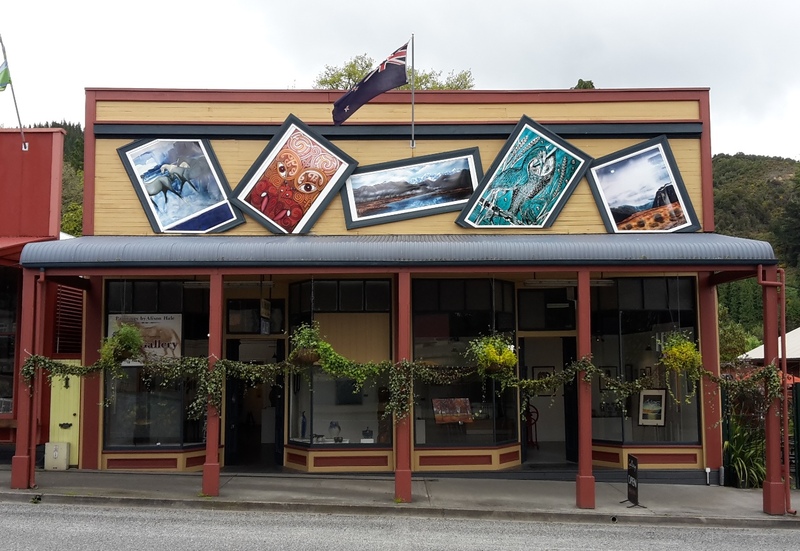 The Hale Gallery is situated on Broadway in Reefton and is open seven days. Alison Hale’s Studio is based in the Old Reefton Courthouse on Bridge Street. Alisons strong, vibrant style reflects the richness and diversity of the coast. The subjects capture the often subtle realtionships between people and place: the courage and strength of the pioneer women, horses, cattle and the men that worked them, and more recently, native fish and the fragile ecosystems they inhabit. Alison has mastered the technique of applying oil paint to a glass surface. It creates a unique depth, translucence and fluidness that is entirely captivating. The image of course, is created in reverse. Alisons signature themes are bought to life in this medium which are now available as high quality, ready to hang, fine art items.